It has been a busy couple of weeks at our house, and things are about to get busier with the baby coming soon! 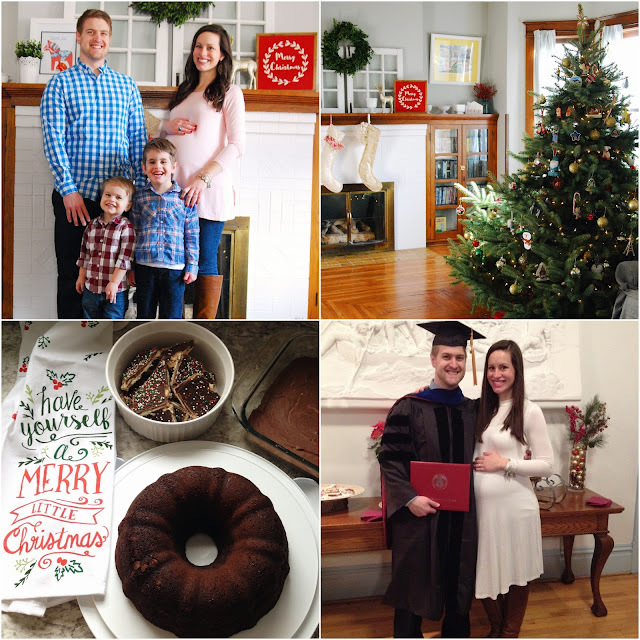 Steve graduated with his doctorate on the 17th, and we celebrated Christmas with both sides of our family a few days ago. 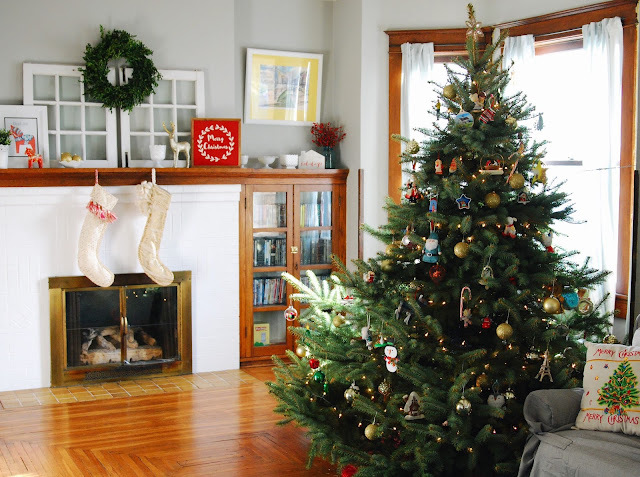 It has been a wonderful December, and I can't believe that it's already time to start packing all of the decorations away and preparing for a brand new year. We hosted a little fika coffeetime and playdate a couple of weeks ago. I made this candy cane coffeecake with cherry cream cheese filling. It was delicious! The boys were so proud of Daddy! Steve started his PhD program two weeks before Nolan was born, and he finished a little over five years later, two weeks before baby #3 was due! After the graduation, we went out for a nice dinner with my mom and Don. Then we met up with my friend Briana and her kids, and we visited Santa at the town library. Nolan was a little starstruck! Later, he told me that he didn't think this particular Santa was the right one. I didn't think he looked very authentic either. Oh well! Give me all the Cadbury Christmas candy! We also made our annual Christmas mice with Hershey kisses and chocolate-covered maraschino cherries. Mmm! Sweet and simple Christmas mantel. On Christmas Eve, we went to MorMor and Papa Don's house. Nolan received his first set of Legos, and he and Daddy immediately went to work building it. The completed plane! The next day, he received the same Lego set from Grandma Z. Great minds think alike! Ephraim intently coloring in his new Paw Patrol coloring book. The boys spent Friday night through Monday night nearly inseparable from their girl cousins from Indiana. We all had the best time! Among the six kids, there were tons of new toys to open and play with! Ephraim doing aerobics with K. He followed her every command! More Lego-building. One of the girls got a 700 piece set that took up many hours of their time and concentration. The six kids after church on Christmas Day. We miss the girls already! I wanted to post one more baby update while I'm still pregnant! 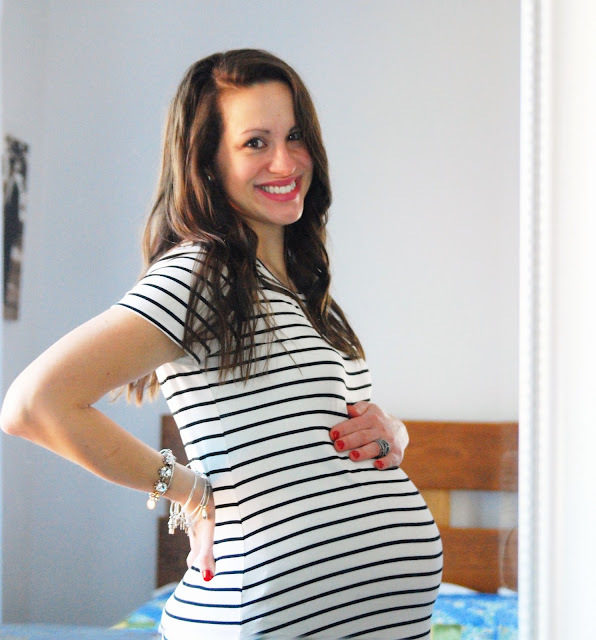 Today, I'm 39 weeks and 4 days, which means my due date is just three days away! Being due on New Year's Eve is a funny thing. I don't know which month or year that our sweet boy will arrive. I get plenty of comments about delivering him on or before 12-31 so we get a tax break for 2016. 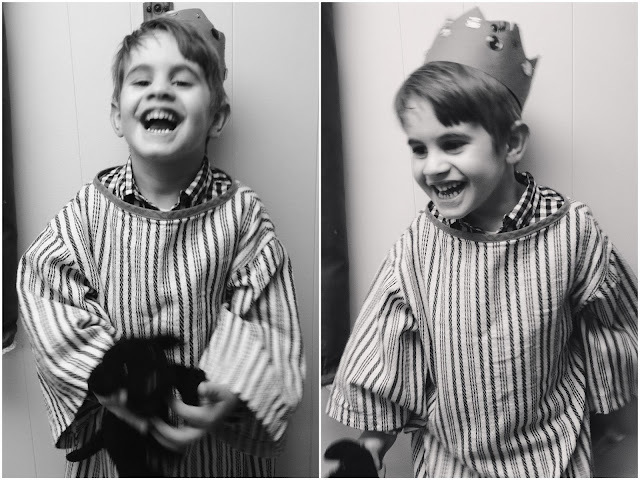 And I get the same amount of comments about how fun it would be to have the first baby of the New Year at the hospital :) Nolan was 9(!) days late, and Ephraim was born on his due date. So we will see what this baby decides he wants to do! I had an ultrasound today, and he looked fine, though a little cramped. I always seem to measure a little small when they use the measuring tape to find the fundal height at the end of the pregnancy. I'm not really worried about it - it seems like an imperfect science anyway. In the ultrasound, baby was predicted right around 8 pounds, which sounds just right! Nolan was 8 lbs 2 oz, and Ephraim was 7 lbs 0 oz. Baby's head has been down for many weeks, and I'm 1-2 cm dilated, 50% effaced. 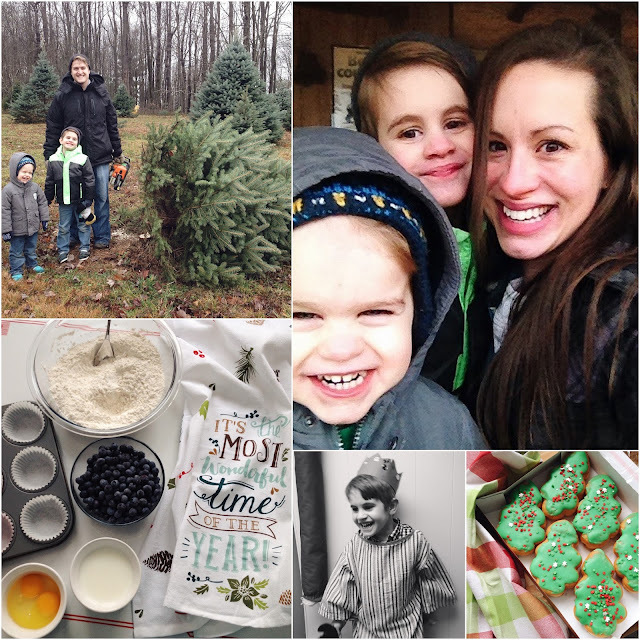 Being so pregnant during the Christmas holiday was an interesting thing. I felt a little overwhelmed trying to balance all of the baking, gift-wrapping, card-sending. . . on top of the nesting, baby laundry, and house-cleaning. I am glad that the baby didn't choose to arrive right on Christmas Eve or Christmas Day, so we were able to spend time with family and attend the Christmas events at church. The Christmas story becomes extra special when you are pregnant, because you can relate to Mary's anticipation of baby Jesus' birth. I don't have many cravings or aversions, but I have eaten my weight in cereal and chocolate. I am addicted to hot cocoa as well. I would love to eat more, but my acid reflux/heartburn has become really intense at night. I sleep very-propped-up on pillows, and I have to cut myself off from eating after 9 or so. For the past couple of months, we haven't had a working kitchen, so that has kept my eating rather simple. Steve installed the sink two days ago, so it's perfect timing to have a completely functional kitchen now! We are thrilled with it! I'm nervous to make Ephraim the middle child. Even though he will be 3 in January, he's still my baby, and I know it will be a big adjustment for him. I hope he loves being a big brother! Veins - my right leg is covered with blue veins, and it almost looks bruised all the way down. I've worn my Jobst compression stockings religiously for many months, so hopefully I've kept myself from further trouble. I become tired and out of breath quite easily. I have a little bit of insomnia and discomfort when I sleep, so I haven't gotten a full night's sleep in quite a while. All preparation for having a newborn soon! Weight gain - 30 pounds. No new stretch marks (plenty from before though), and my belly button has never popped. I'm definitely emotional and irritable. I try to be patient with the boys and the dog, but it's hard to stay calm sometimes. The baby has been a really big mover. There is nothing quite like seeing the waves of movement across my stomach and seeing a tiny foot stick out of my right side! We are so blessed to have had this pregnancy after our miscarriage in February. I am praying that his delivery will be smooth sailing, and we will be home with our sweet boy in no time at all. One day, Nolan and I went to Tractor Supply to buy dog food, and he was super excited to see Christmas trees! A couple days later, we headed out to the mountain to chop down our own tree at Denny & Sue's house. This is our second year of having a real tree, and it's a pretty blue spruce that Denny planted years ago. It looks like a reasonable size growing outside, and then in our living room, it is large and in charge! I love it! Counting the rings, I figure it's around 12-15 years old. It was a chilly day, and Ephraim wanted to be in Denny's garage on his tractor. Such a fun experience to choose our own tree and carry it home on top of our car! E is such a little artist! At this age for Nolan, when he went to Sunday School or MOPS, he would come home with one big red scribble on his papers. Ephraim takes his time and uses a lot of color! We built little wooden ornaments at Lowe's Build & Grow workshop on a Saturday morning a couple of weeks ago. I went back out to Denny & Sue's to make wreaths with the gals in my Bible study. We had such a nice time! I covered my wreath with winter berries, and I love the pops of red. I made a second little wreath with rhododendron leaves and a piece of driftwood. Some of my favorite ladies! My 36.5 week photo. I'll be 38 weeks tomorrow, and I can't believe it! Baby is really growing and moving around in there. I need to write a post to document the last few weeks of this pregnancy. We found Nolan Road! It was actually a terrible experience involving my van almost getting stuck in the mud in the middle of nowhere. I will be staying on paved roads from now until forever! A cute little Bed and Breakfast on the edge of town, all ready for Christmas! My friend Heidi had a cookie-decorating party at her house last Friday. The kids got to wear their Christmas jammies and eat their weight in sprinkles. So fun! We made some blueberry muffins from frozen blueberries we picked in August. Yum! We are baking up plenty of Christmas cookies and pastries in these next few days! Our kitchen countertop is supposed to arrive today, which is really exciting. Pretty soon, we'll have the sink installed and a full working kitchen again after two months! Christmas tree donuts, for the win! 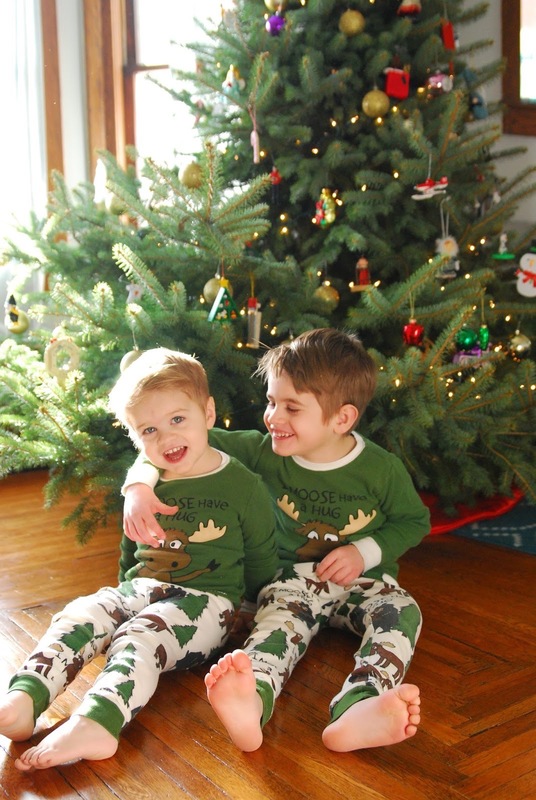 I posted about the boys in their Christmas jammies yesterday, if you missed that. And guess what??!? Steve GRADUATES tomorrow!! We are so very excited to see him walk across that stage and get that PhD! Hope you have a great weekend! Stay cozy!